A folk-maid, so humble, untarnished and pure by nature, ranks among the most popular images of the Latvian folklore. White is she glowing, casting ever radiant light of virtue and chaste upon everything around her. After World War I, when Latvia had become an independent state with its own national currency, among the authors of the new lats banknotes and coins was the graphic artist Rihards Zariņš (1869–1939), Director of the State Securities Printing House. For the obverse of the 5-lats silver coin he chose his 1921 design of the large coat of arms of the Republic of Latvia, which was created on the basis of the draft design of the state coat of arms made by the graphic artist Vilhelms Krūmiņš (1891–1959). On the reverse he depicted a Latvian folk-maid as a symbol of national ethical purity and virtue of hard work. For centuries nurtured through folklore, this image was close and understandable to every Latvian. The prototype of the Latvian folk-maid was Zelma Brauere (1900–1977), a proof-reader of the State Securities Printing House, whose youth, beauty and gentle demeanour fascinated many people, among them R. Zariņš who had often portrayed her before. Various images of Zelma Brauere can be also recognised on the 10-lats and 20-lats banknotes designed by Rihards Zariņš as well as on the covers of elaborate telegrams and, highly generalised, on the 50-santims coin. This generalisation finds the most exquisite expression on the silver 5-lats coin, with the plaster model by Percy Metcalfe, a distinguished engraver of The Royal Mint, United Kingdom, contributing to its attainment. The head of the folk-maid is featured in profile, viewed from the right side, with this central motif being encircled from either side by the inscription Latvijas Republika. To bring out the idea powerfully, the artist has opted for only few details: ears of corn overlaying the folk-maid's shoulder, a rich braid stretching down her back, and her collar and head dress embroidered with an ornamental design characteristic of Latvian folk costume. The artistic expression is intensified by the serene beauty of mutual relationship of all elements and the simultaneous lightness and firmness of the silhouette. The 5-lats silver coin became extremely popular due to its pleasing artistic expression and value. Its central image obtained an extra symbolic meaning like the statue of Mother Latvia in the sculptural ensemble of the Brethren Cemetery and the statue of Liberty that tops the Freedom Monument in Riga. People gave 5-lats silver coins to their children and grandchildren as gifts; they stored and kept them "for a rainy day" – as if they had some apprehension, some foreboding. When during World War II the occupational regimes replaced one another and Latvia lost its independence and national currency, this silver coin became a symbol of freedom and statehood for the nation, a comforting ray of hope for those scattered in Siberia and in exile across the globe. The Bank of Latvia dedicated a 5-lats gold coin to the 10th anniversary of the renewed national currency of Latvia which also featured the design of the historical 5-lats silver coin. It was issued under the international coin programme "The Smallest Gold Coins of the World". 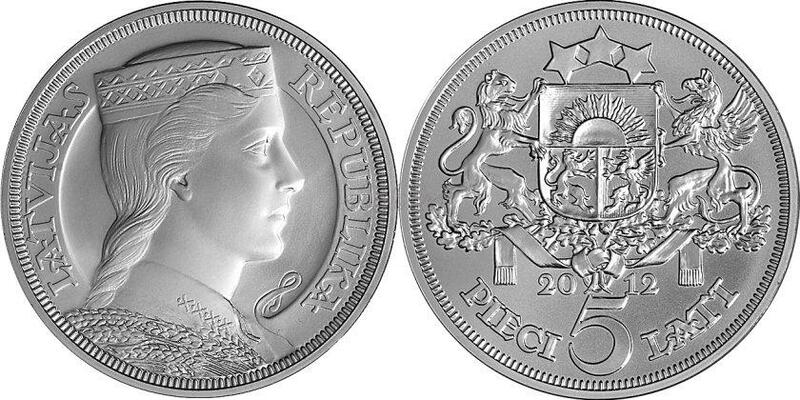 The design of the coin was modified by Gunārs Cīlītis (1927–2007) and the plaster model was made by Ligita Franckeviča (1947). The coin was struck by Valcambi SA (Switzerland). To mark the 90th anniversary of the Bank of Latvia and the national currency unit, the lats, and the 20th anniversary of the renewed lats, the Bank of Latvia issues a new silver 5-lats coin using the original electrotypes produced in 1929 and employed in minting this coin in 1929, 1931 and 1932. The coin has its own unique history and its happy journey continues. The large coat of arms of the Republic of Latvia is placed in the centre. The numeral 5, topped with the year 2012, is inscribed beneath the central motif. The inscriptions PIECI and LATI, arranged in a semicircle, are placed to the left and right of the central motif respectively. The central motif is a Latvian folk-maid in profile, viewed from the right side. The girl has ears of corn on her shoulder. The inscriptions LATVIJAS and REPUBLIKA, arranged in a semicircle, are placed to the left and right of the central motif respectively. The inscriptions DIEVS, SVĒTĪ and LATVIJU, separated by three hexagonal stars.